Shortly before I moved to Elderberry Bay, the quaint village on Pennsylvania’s Lake Erie Shore had a new nickname—Threadville. That was because my best friend, Haylee, and her three mothers (Haylee was raised by her mother and her mother’s best friends) had each opened a textile arts store on Lake Street—a fabric shop, a yarn shop, a notions shop, and a quilting shop. Since I moved here, a home décor shop opened, and a father and son team are now talking about starting a costume shop where the general store used to be. We all offer courses and workshops, so as you can imagine, Threadville has become very popular. Tour buses arrive most days, and everyone has fun. Except for murder. But that’s all over, right? There is also a Threadville in Mississippi, and that’s its real name. And Willimantic, Connecticut, is known as Thread City because of its history of cotton mills that produced thread. I wish I could go back in time and see those mills in action. Today, Willimantic has a wonderful bridge decorated with huge sculptures representing spools of thread. I love it! But it gets even better--four of the spools are topped by whimsical statues of green frogs. And no, they have nothing to do with thread-making, but a lot to do with another, and rather peculiar, facet of the city’s history. For pictures and the full story, click here. Does your town have iconic structures and sculptures? 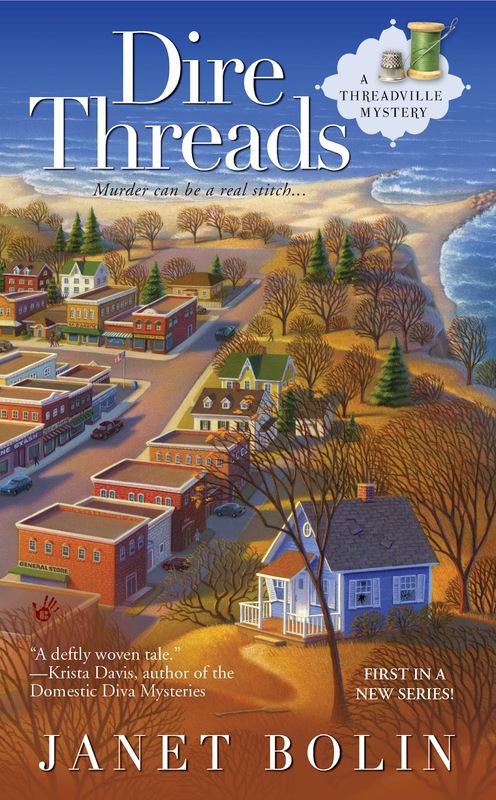 If you know anyone who lives in Threadville, Mississippi, or Thread City, Connecticut, or any other location with the word thread in it, please write to me: Willow@ThreadvilleMysteries.com. I’d love to hear from you! 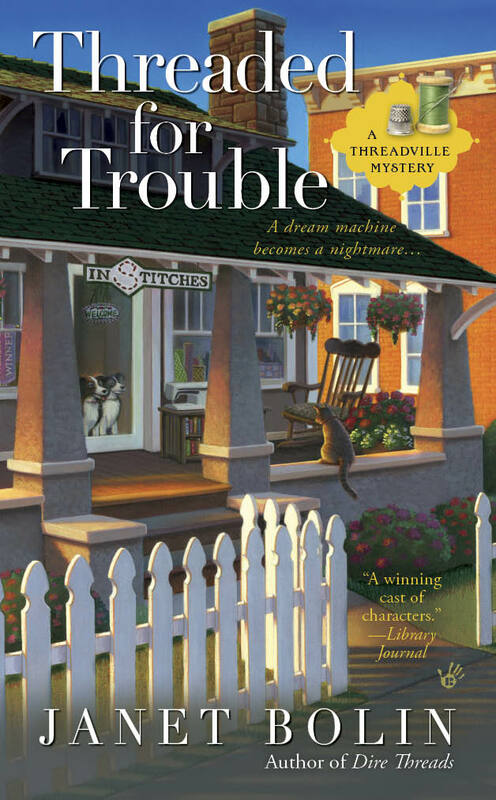 You can find out how Willow and her friends solve a murder, in THREADED FOR TROUBLE, the second book in the Threadville Mystery series. DIRE THREADS, the first in the series, was nominated for both an Agatha Award for Best First novel and for the Bloody Words Light Mystery Award (the Bony Blithe.) You can order DIRE THREADS and THREADED FOR TROUBLE from any bookstore or from these booksellers. 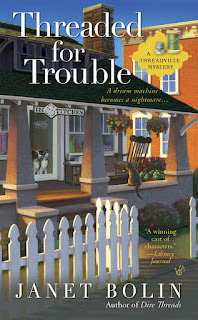 Visit Janet at facebook and twitter and check here again for information about the third Threadville Mystery, due out in June, 2013. I love neat histories behind town names! Interesting! Some day, I hope to find out how Threadville, Mississippi, got its name.